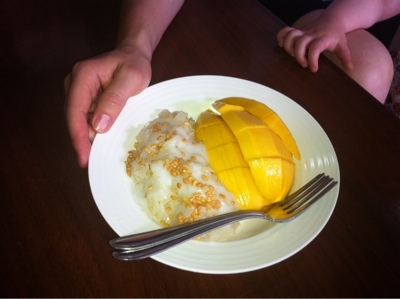 No visit to Thailand would be complete without sampling the mango with sticky rice. We make this at home and while we have been happy with our efforts we really wanted something to compare against. 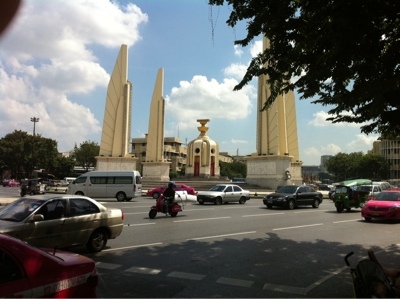 My guide recommended Gor Panich as an operation with the best version in all Bangkok. We hailed a taxi and used my new strategy which is to ask for a nearby temple (Wat) which in this case was Wat Mahan Param. My pronunciation must have been ok as the driver got us to the right area. The temple us also close to the Democracy monument which was the source of some confusion a few days earlier. 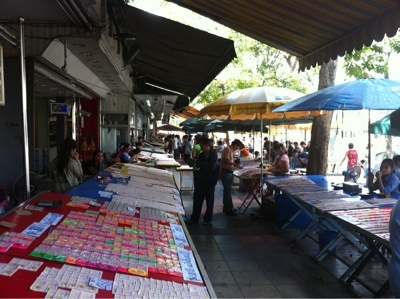 The front of the temple has hundreds of lottery ticket vendors which I assume are located near temples for good luck. We headed in the right direction and did our usual trick of asking locals and showing them my phone which fortunately has the place name in both Thai and English. This worked a treat again and we found the place very quickly. Although we were pretty full by this time we managed to scoff down a serve of mango sticky rice which we are proud to say was very similar to what we have prepared at home and to be honest I have to say the Queensland mangos are much sweeter than the Thai mangos. I guess we have David Thompson to thank for how closely we were able replicate the Thai recipe. We decided to head to a department store for some air conditioning and flagged down a tuk tuk. Unlike the taxi drivers the tuk tuk drivers have no problem accepting a fare when they have no idea where you want to go! So the driver took us down random laneways and did u turns etc until he decided to ask directions. We had asked to go to Worojak department store as it was listed as close by on my map. So he didn't take us there but instead dropped us off in the general area to fend for ourselves. After getting directions from some friendly locals we arrived at an air conditioned mall that was some kind if auto parts centre and obviously not what we were looking for. At least they had good toilets which Tina was happy to use. We left quickly after that and headed back to the area of our hotel. 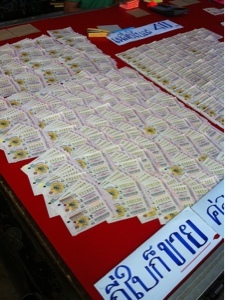 The driver took us in a huge loop to secure a few extra Baht fare which although understandable does become tiring. As we are leaving tomorrow we picked up some snacks for Charlie for the plane and feeling pretty cocky at this point I bought a drink with ice in a plastic bag from a street vendor, so far so good! We then headed back to the hotel and picked our laundry up from a place Tina had found for 35 Baht a kilo compared to the 35 Baht an item the hotel wanted to charge! I bought a few shirts and some fisherman pants as I did not pack many clothes and had to wear some of Tina's pants today. I'm pretty sure they are unisex though! We are now enjoying a few beers on the balcony while Charlie sleeps and of course I have some Miang to go with the beer. I also bought some extra scuds at the Nang Loeng market just to be sure we don't run out.